Absolutely Beautiful Unique Ring. High Gloss Finish. UK Seller. This classic solitaire ring is made of fine sterling silver, stamped with a “925” quality mark and rhodium plated. 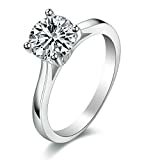 Features high quality round cut 4-prong set cubic zirconia CZ (1.25 carat, 7mm). Band measures 2.5mm in width. Gift Boxed.